Remember This Cubs Tweet From Saturday Night? 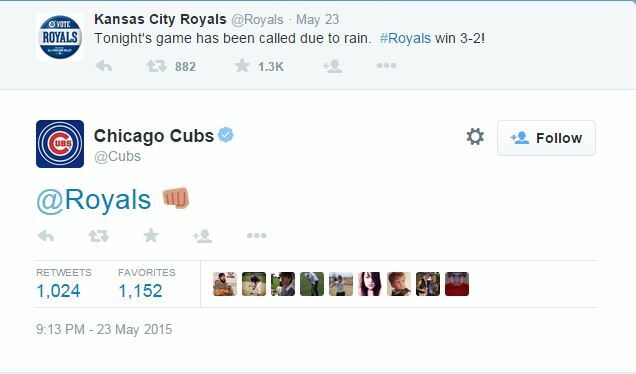 If you frequent Twitter and were checking it Saturday night, perhaps you saw the Cubs’ reply to the Royals’ tweet about the outcome of that evening’s (unfortunately) rain-shortened game. Clever, right? Ha ha, the Cardinals lost, thanks for the huge favor of putting the Cubs one game closer when May isn’t even over yet, Royals! Fist bumps all around! Sure, it’s great that the person now handling the Cubs Twitter account has a sense of humor and is engaging and interacting with fans. And, sure, it’s certainly Twitter friendly to play up the long-time Cards-Cubs rivalry — look at the number of retweets and favorites of that for proof. Yes, the Cardinals Twitter account certainly could step up the creativity and the interaction … and maybe even take over the “#WeAreGood” hashtag the Cubs account (and Cubs’ fans) love so much. But have you paid attention to what the Cubs have done since beating the Diamondbacks on Saturday night, after the Royals beat the Cardinals? On Sunday they lost to the Diamondbacks 4-3, which resulted in them losing the series as well — Arizona won in 13 innings Friday night. Yesterday, the Cubs lost 2-1 to the Nationals. And, not that it matters or means anything, but the Cubs are now 4 1/2 games behind the Cardinals, who of course won on a Jhonny Peralta walk-off homer in the 10th. As for the Royals, with the Twitter exclamation of winning the Mother Nature-influenced rainy game on Saturday? 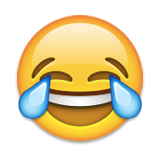 Obviously they lost on Sunday, but they also lost yesterday to the Yankees … by a score of 14-1. The Yankees had 3 homers and scored 8 runs in the first inning — 2 of the homers and 5 of the runs came before Jeremy Guthrie even got an out. And, if they wanted to, the Cardinals certainly could have responded with an emoji greeting of their own to both their NL Central and interstate rivals. This one certainly would have been appropriate. Ah, well. Maybe another time. The Cardinals and the Diamondbacks continue their series tonight, with Jaime Garcia making his first start at Busch Stadium since last June 20. Rookie Archie Bradley starts for Arizona. This entry was posted in 2015 Cardinals and tagged Chicago Cubs, Kansas City Royals, Twitter by Christine Coleman. Bookmark the permalink. I would rather we let our winning ways speak for itself. There’s no need to dignify the silliness coming from the Cubs with a response. Except to beat them like we surely will when we play them. Go Cards!! Someone feeling a little underappreciated? #BestFansinBaseball. Am I right? oh, loosen up. let them have fun. prior to this season, our Cards were only +3 head-to-head vs. the Cubs since 2006. #WeAreBetter, but we don’t always play like it. it’s okay to have fun, yet respect our enemies. go Cards!